Lineage. Constituted 29th Reconnaissance Squadron (Heavy) on 28 Jan 1942. Activated on 3 Feb 1942. Redesignated: 419th Bombardment Squadron (Heavy) on 22 Apr 1942; 419th Bombardment Squadron, Heavy, c. 6 Mar 1944; 419th Bombardment Squadron, Very Heavy, on 5 Aug 1945. Inactivated on 15 Oct 1945. Redesignated 419th Bombardment Squadron, Medium, on 20 Aug 1958. Activated on 1 Dec 1958. Discontinued, and inactivated, on 1 Jan 1962. Consolidated (1 Oct 1992) with the 6519th Test Squadron, which was designated, and activated, on 10 Mar 1989. Redesignated: 419th Test Squadron on 2 Oct 1992; 419th Flight Test Squadron on 1 Mar 1994. Assignments. 301st Bombardment Group, 3 Feb 1942-15 Oct 1945. 301st Bombardment Wing, 1 Dec 1958-1 Jan 1962. 6510th (later, 412th) Test Wing, 10 Mar 1989; 412th Operations Group, 1 Oct 1993-. Stations. Geiger Field, WA, 3 Feb 1942; Alamogordo, NM, 28 May 1942 (operated from Muroc, CA, c. 28 May-14 Jun 1942); Richard E. Byrd Field, VA, 21 Jun-19 Jul 1942; Chelveston, England, 19 Aug 1942; Tafaraoui, Algeria, 24 Nov 1942; Biskra, Algeria, 21 Dec 1942; Ain M’lila, Algeria, 16 Jan 1943; St-Donat, Algeria, 8 Mar 1943; Oudna, Tunisia, 6 Aug 1943; Cerignola, Italy, 10 Dec 1943; Lucera, Italy, 2 Feb 1944-Jul 1945; Sioux Falls AAFld, SD, 28 Jul 1945; Mountain Home AAFld, ID, 17 Aug 1945; Pyote AAFld, TX, 23 Aug-15 Oct 1945. Lockbourne AFB, OH, 1 Dec 1958-1 Jan 1962. Edwards AFB, CA, 10 Mar 1989-. Aircraft. B-17, 1942-1945. B-47, 1958-1961; E-47, 1961. B-52, 1989- Operations. Antisubmarine patrols off California coast, late May-early Jun 1942. Combat in ETO and MTO, 5 Sep 1942-c. 26 Apr 1945. Electronic countermeasures, 1958-1961. Tested advanced cruise missile on the B-1B, B-52, F-15, F-16, and A-6 aircraft, 1989-present. Operations. Performs flight testing on B-2 Spirit, B-1 Lancer, and Boeing B-52 Stratofortress strategic bombers. 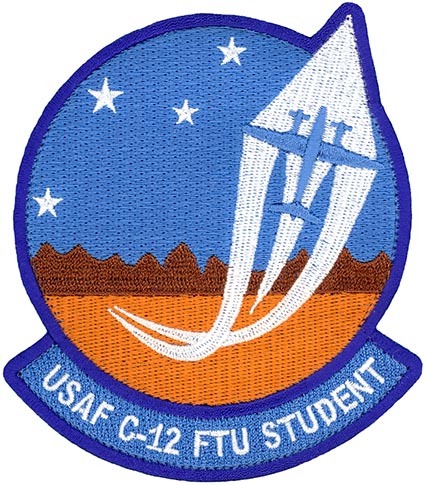 USAF C-12 Formal Training Unit, 2012-. Campaign Streamers. World War II: Antisubmarine, American Theater; Air Offensive, Europe; Egypt-Libya; Tunisia; Sicily; Naples-Foggia; Anzio; Rome-Arno; Normandy; Northern France; Southern France; North Apennines; Rhineland; Central Europe; Po Valley; Air Combat, EAME Theater. Decorations. Distinguished Unit Citations: Tunisia, 6 Apr 1943; Germany, 25 Feb 1944. Air Force Outstanding Unit Award: 1 Jan 1961-1 Jan 1962. Emblem. MOTTO: SILENT STING. Approved on 21 Feb 1990; replaced emblem approved on 11 Aug 1961.